The bathroom is one of the most used rooms in your home, and you use it for a variety of reasons and tasks. Whether you’re getting ready for a night on the town or taking a relaxing bath after work, having the proper lighting for a functional, multi-operational bathroom is extremely important. 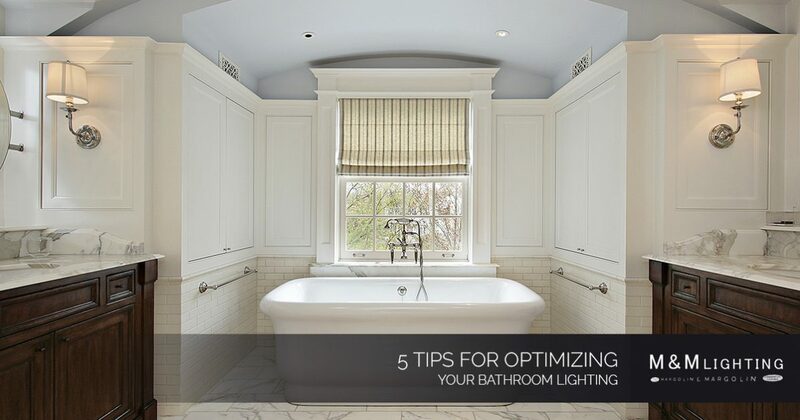 If you’re ready to upgrade and optimize the interior lights of your bathroom, read about our five tips in this blog post. At M&M Lighting in Houston, Texas, we offer a variety of interior lights and exterior lighting solutions for your home. Whether you’re searching for updated bathroom lights, a new chandelier for your dining room, or basic wall sconces, our lighting specialists can connect you with the necessary lighting fixtures that fit your style and budget. Schedule an appointment today. 1. Stick bright wall lights next to your bathroom mirror. Interior lights around your mirror or vanity area are essential for providing adequate and efficient lighting for your day-to-day tasks. Basic ceiling lights can get the job done, but they create shadows and unwanted lines on your face when you’re performing tasks at your sink, such as shaving or putting on makeup. Whether you choose vertical wall sconces or specific vanity lighting, installing lights around your bathroom mirror makes for perfect task lighting. 2. Choose lighting solutions that illuminate the room when natural lighting is nonexistent. The best way to optimize the lighting in your bathroom is to design your lighting solutions after the sun goes down. Natural lighting is great, but once the sun sets, your bathroom can feel significantly darker if you’re solely relying on it. By waiting until your natural lighting is gone for the day, you’ll be able to see which spaces in your bathroom need the most attention in regards to lighting. From there, you can find the necessary interior lights to provide sufficient illumination to those areas. 3. Focus on ceiling lights first, then add task lighting. Most lighting experts suggest focusing on the ceiling lights in your bathroom first before adding any further lighting fixtures. Ceiling lighting is most important because it provides general illumination for the room, even though it might not always be the most optimal lighting solution by itself. After you have your ceiling lights situated, you can add task lighting, which is essentially lighting that will help you complete certain tasks you’ll perform in your bathroom. For example, vanity lighting, under cabinet lighting or lighting above your shower or bathtub area are lighting solutions that important to getting specific bathroom tasks completed. 4. Add a chandelier above your bathtub for a relaxing ambiance. For a unique twist in your bathroom, we suggest adding a chandelier to the room for a more sophisticated and spa-like ambiance. For additional control on how bright you want the chandelier to get, we suggest installing it with a dimmer so it can be both practical and trendy. 5. Choose at least two interior lights for your shower/tub area. Experts suggest using more than one light for lighting your shower and bathtub area in your bathroom, which is the usual go-to lighting solution for typical bathroom lighting. One light might seem like enough lighting for the area — and sure, it’s sufficient — but you’ll really notice a difference when you add two lights to the area. Two lights will add symmetry to the space and functionality when you need to read or see things. For safety precautions, place these bathroom interior lights directly over the space you’ll utilize to illuminate as much of the area as possible. Our team of lighting specialists at M&M Lighting can help determine what interior lights will work best in your home’s bathrooms. We have the knowledge and expertise to connect you with lighting solutions that are functional and stylish, thanks to our experience serving the greater Houston community for more than 50 years. Choose M&M Lighting to help choose interior lights and exterior lighting solutions for your home projects. For more information, call our team at (713) 469-3002 or visit our Houston showroom today! P.S. Don’t forget to sign up for our email newsletter, where you will receive exciting company news, lighting advice and tips, and special M&M promotions and offers.